Just as the article suggests, I had a run-in with a quiet electric car on the road this past week. I was cycling on a very narrow, windy road in Rancho Santa Fe, California, when a swerving Nissan LEAF almost pummeled right into me. On a blind corner, the LEAF was veering out of its lane; I didn’t even hear it coming. Obviously, all well-versed cyclists wear a helmet that is government mandated for safety standards. Some who go above and beyond to make sure that their noggins stay intact get a helmet with MIPS (Multi-Directional Impact Protection System) that allows the helmet to better absorb force (you will see a MIPS sticker on the box if the helmet has this feature). In addition to helmets, many cyclists now also are investing in disc brakes. According to bicycling.com, “With their excellent stopping power, superior speed modulation, and better all-weather performance than traditional rim brakes, disc brakes make huge impacts on your ride.” Depending on preference, cyclists can either get mechanical or hydraulic brakes to help them achieve fast stopping times while riding. Finally, an easy safety precaution that a cyclist can take is to wear safety apparel. Usually, this means wearing a neon vest or similarly protective brightly colored clothing. For me, though, wearing layers of reflective gear on top of my cycling jersey is simply not an option in the hot weather we experience in San Diego. To take safety to a greater measure, radars are now being used to alert cyclists when cars are approaching. On my windy rides, these could be of life-saving value. After reading the above mentioned article by Forbes, I hopped online to research radars for cyclists on my own. I found that they are widely available and very well-reviewed by cyclists who have used them. Seemingly the most popular is called the Backtracker. A popular Backtracker is now made by Garmin is called the Varia Rearview Radar. It lists for $199.99 which in my opinion is well worth a saved life. This amazing little device uses a radar signal to help alert cyclists whenever a car is closing in close behind. The device is comprised of two pieces. One of the modules is mounted on the seatpost while the other sits on the handlebars. 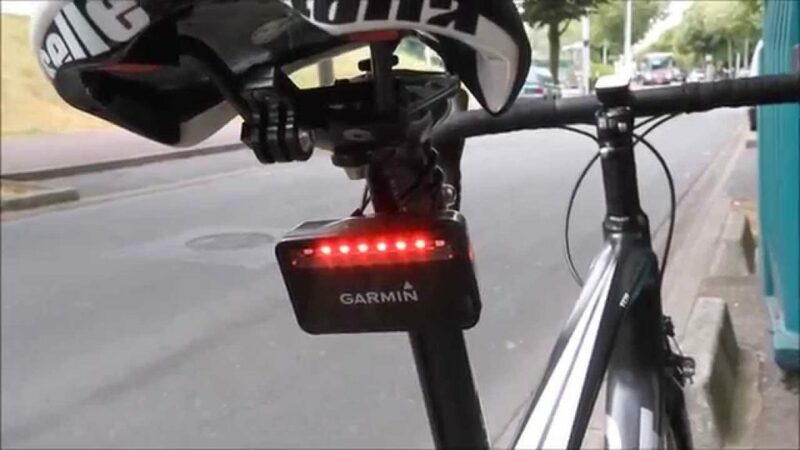 When a car is within 153 yards of the back of a cyclist, the radar reflection kicks in and sends a signal from the seatpost module to the handlebar module. The front module then alerts the rider by lighting up a row of LEDs. When the car gets closer, the row of LEDs increase. Another great feature of this device is that the rear tail light switches from a slow-blinking mode to a quickened blink. This is in hopes that it will catch the attention of the individual driving the car in the back and alert them of the cyclist’s presence. A helpful video by DC Rainmaker shows exactly how this system looks in action. Take a look if you’re interested in checking this product out. Thank you for reading, as always! Happy cycling.